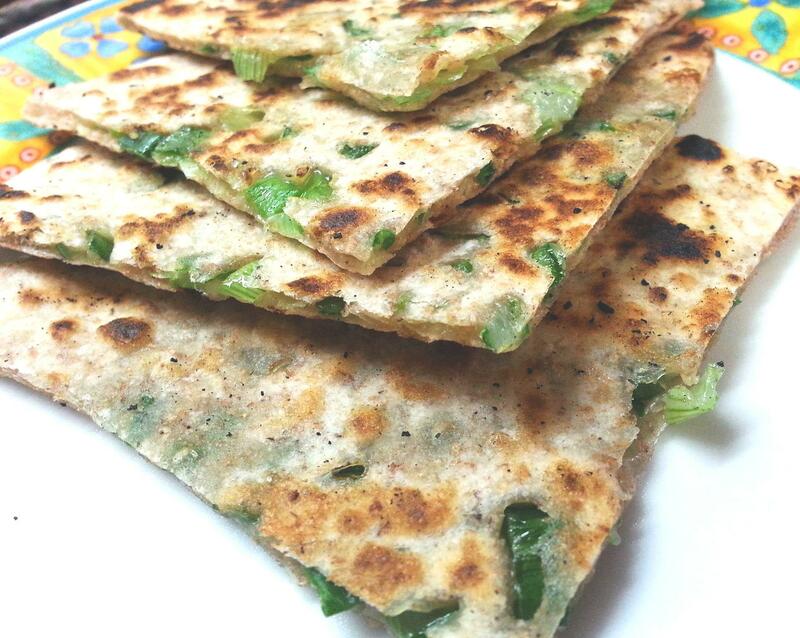 Parathas make an excellent snack, side or breakfast dish. One can make parathas with a variety of filling, both healthy, unhealthy, sweet and savoury. Its now winter in Spain and our vegetable shops have spring onions in abundance. I decided to make some parathas with them, not knowing how they would taste. Well…. tasting is believing…so get your rolling pins out and try this amazing recipe! The spring onions I have used are normal ones ( here we get chinese ones too), they need to be washed, pat dry and then finely chopped and wrapped in a kitchen towel to remove all their moisture. Put the flour in a bowl and add the salt and pepper to it. Make a soft pliable dough using warm water and knead the dough for at least 10 minutes till very elastic and pliable. Keep aside covered for 10 minutes. Heat an iron gridle on medium heat. Make equal balls out of the dough. Roll each ball into a flat round disc . Take one rolled disc and spread it with some spring onions. Cover it with another dough disc and seal it all around by pressing with your fingers gently. Sprinkle some dough on both sides and roll it out a bit more so that it evens out. Brush one side with oil or butter and put it to cook on the gridle. When browned on one side turn it around and cook on the other brusing it with oil. Once both sides are cooked, it is ready to be served and eaten. This is best eaten with a pickle or a chutney. This entry was posted in Breakfast, Crepes, Everything Vegetarian, Floury Matter, Fusion, Healthy Options, Low Cost and tagged parathas, spring onions, Vegan, vegetarian. Bookmark the permalink.